Of course that one shrub I visit every morning is looking fantastic. Can't accuse me of neglecting my shrub. Our attention has turned to these poor, neglected shrubs. Actually, there's a good reason they've been neglected. You know, they call me "Digger" for a reason. Amoungst these once lovely shrubs is where I gained my reputation as an accomplished digger. I dug up the landscaping cloth, buried the mulch, made semi-permanent holes - basically creating a big mess. When I saw Kayce walk away in disgust last year, I had a feeling these shrubs were going to the back burner. But, I've turned over a new leaf (metaphorically speaking) and no longer dig holes. Well, for the most part. Occasionally, when it's hot and I've been banished to the yard for some indoor rules infraction, I have relapses. All in all, though, I'm leaving stuff alone. So it's not going to be wasted effort to bring these shrubs back to life. First, we (Kayce) pulled out the vines that had overtaken the shrubs this rainy, hot summer. Then we (Kayce) sprinkled some Pure Black Castings™ and VermaMax® around the shrubs and washed it in. After a few days, we'll add a VermaPlex® drench. 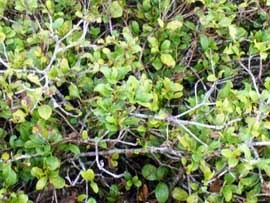 Does this shrub have time? 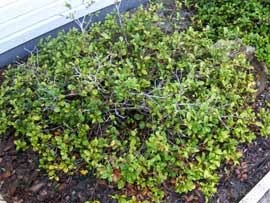 Although it's getting late in the season, there should be time for the shrubs to put out some growth. Then, in the spring we'll add the castings/VermaMax®/VermaPlex® treatment. I've promised to leave the shrubs alone from now on. When the urge to dig comes over me, there's always the planter in the front yard. 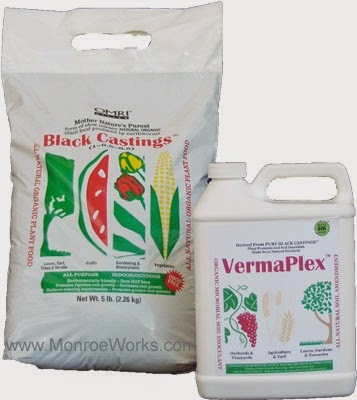 Organic Shrub Fertilizer: Combo Pure Black Castings™ and VermaPlex® for shrubs, lawns and gardens. Extra Nitrogen For Shrubs: VermaMax® also provides an amazing 6% calcium.